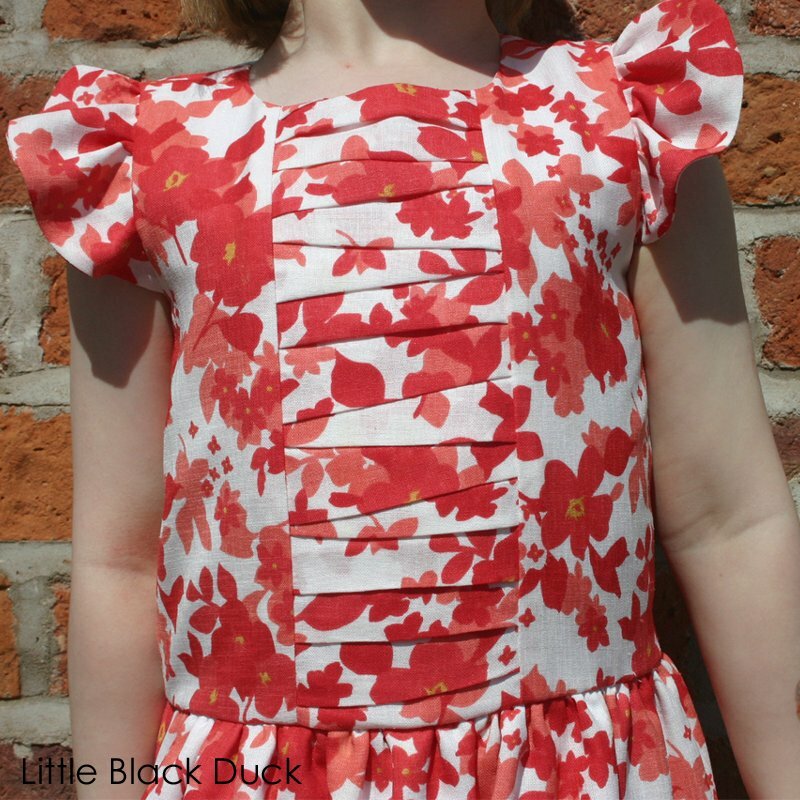 I saw this rather fabulous Straightgrain Hanami Dress as sewn by Olu of Needle and Ted a while back and I really couldn’t resist making one of my own, well, for Charlotte anyway. I was totally taken with Olu’s fabric choice so I trawled my most used online fabric stores, but couldn’t find a brightly coloured tartan taffeta anywhere. A raid on the stash was required! I found this red, pink and white floral fabric that had good deal of body and didn’t seem to crease, no matter how much you scrunch it up in your hand. So perfect for a little girl’s dress! I have no idea where it came from, but I was so pleased when I found it. I decided to fully line the dress as it was a touch on the sheer side. Not too sheer, but enough to make me want to line the skirt as well as the bodice. I also figured that the extra fabric at the waist seam would make the skirt flounce out as much as possible. 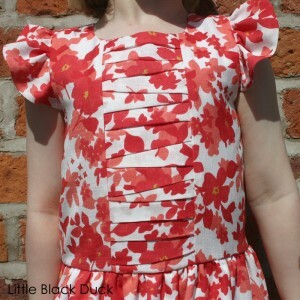 I followed the tutorial that An wrote for for making improvised pleats on the bodice. It was simple to follow and I love the interest it provides. And those sleeves, how could you not love those sleeves? Just so pretty and just like the petals of a flower…totally girly! 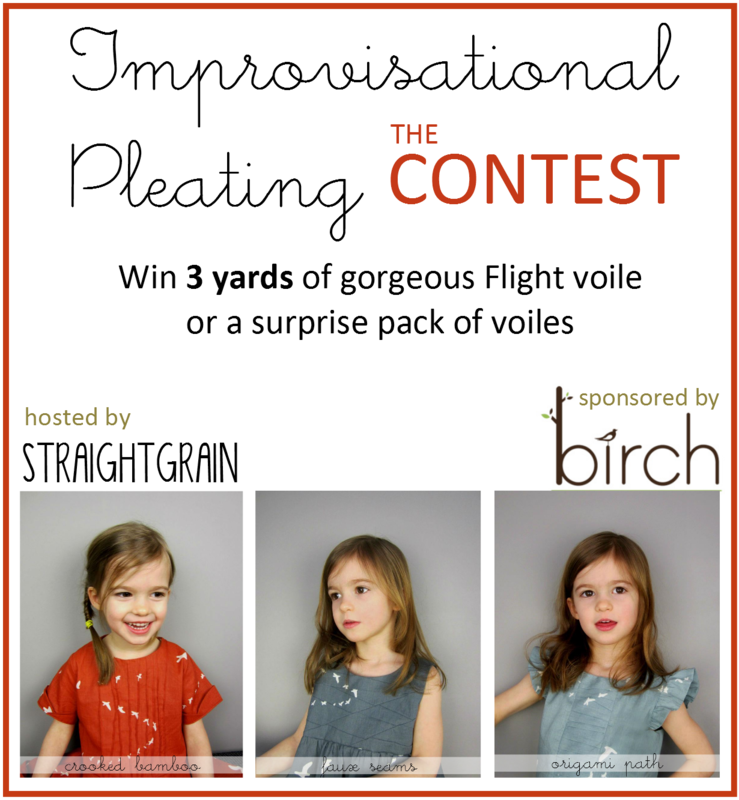 An is running a competition over the next few days where you can enter your own attempts at improvisational pleating. 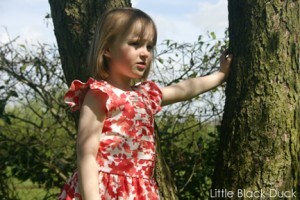 There’s a chance to win some fabulous fabric from Birch. I will be asking for all of you lovely readers to vote for me when the voting opens in a couple of days time! Wow, the dress looks really adorable! Wow, what a compliment, I’m totally flattered. That tartan taffeta was such a find. And you won’t believe it cost just £4 a meter. 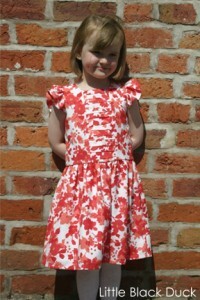 Your hanami dress is so pretty, great choice of fabric. I’ll be entering the competition too. I’m in love with improvisational pleating. £4 is amazing value! Very jealous! It’s funny to think that gorgeous fabric was right there in your stash just waiting to become this pretty dress. Very nice job. Thanks Angela. I love it when something from the stash finds it’s calling! The contest has closed now, and I just wanted to pop in and thank you for participating. I absolutely love your dress – what a great fabric choice! Thank you so much!